Mama got a new food processor! I think it’s a combination of two things: 1) I often buy cheap appliances. 2) I use my kitchen appliances constantly. Therefore, when my previous food processor broke, we decided that instead of paying around $30 for another cheap food processor that would break in a year or less, we should save up and invest in a food processor that would last (because that would save us money in the long run!). So, we saved. And while we were saving, I continued to use my broken food processor that still sort of worked, but if left unattended would fly off the counter and spray peanuts into the living room. 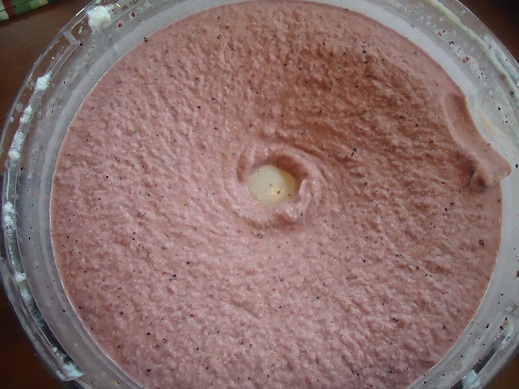 The last day I used my old food processor, everyone was at the table waiting for their Mock Frozen Yogurt when all of a sudden, because I wasn’t holding the gadget with all my weight and standing on my right pinky toe just right, we had a sudden flinging of frozen berries and yogurt. The boys watched in astonishment as their Mama shrieked, the result of three frozen blueberries striking her on the forehead. The walls were covered in spattered yogurt and half the ingredients were dripping off the nearby pile of mail. And so we looked around a little bit and decided on the Kitchen Aid 9-Cup Food Processor. I cringed when I first saw the price, because I’m used to buying cheap appliances. But now that I’ve got it all set up in my kitchen, I’ve decided that it was worth every penny. It’s so heavy duty that there is no comparison to the dinky things I formerly used. Ain’t she purty? I’ve been playing…wanna see? I spent several hours playing with her the first day she arrived. (I’m calling her a her because she’s so lovely and because there are plenty of males in our household so I can call her a her if I want to.) As you can see, I began by making Peanut Butter. Two batches actually. 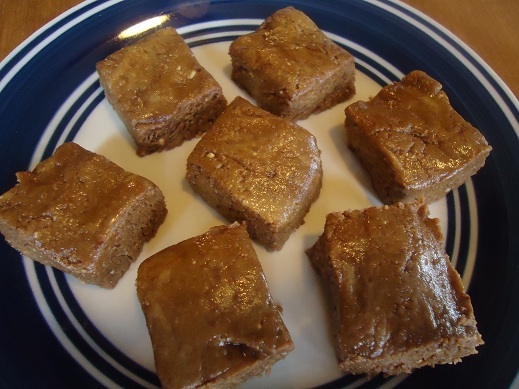 The boys ate the Homemade Peanut Butter on their Whole Wheat Waffles, then I used some of it to make Peanut Butter Honey Fudge. This processor made my Homemade Peanut Butter making experience SO much easier!!!! 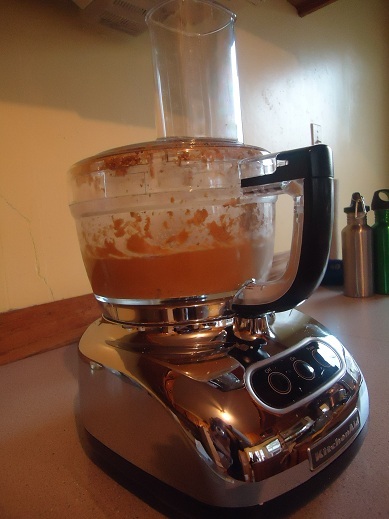 What do you know…a food processor that actually works efficiently! 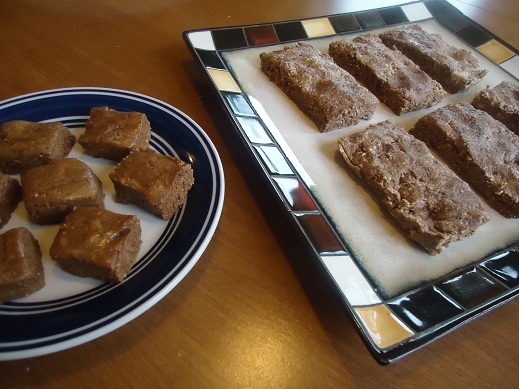 Next, I got out my cashews and dates and made some Homemade Larabars. 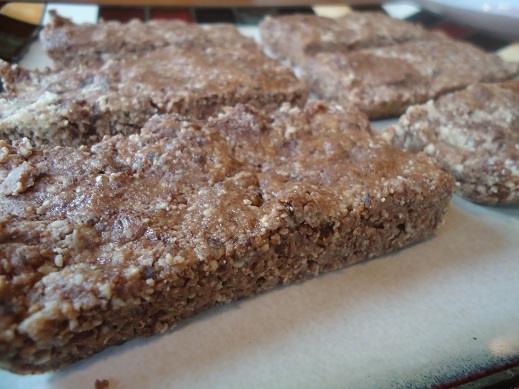 Wow, those are fun to make and deliciously healthy for snacks! After I made those snacks, I got her all cleaned up and made some Mock Frozen Yogurt to go with our lunch. After all, I needed to see if I could make this treat without the drama of the previous Mock Frozen Yogurt mishap. I’m happy to report that with my new Kitchen Aid 9-Cup Food Processor there was no blueberry violence or yogurt flinging. Nor did any peanuts shoot into the living room. All was calm in the kitchen as my new investment went to work for me. So, do you have a food processor? What kind do you have? Do you tend to buy cheap appliances, or do you invest in more efficient ones? Ever been a victim of frozen berry violence? And SO… I have a heavy duty KitchenAid mixer and a Vitamix. The day I got each of them, I went into as many gushing commentaries as your post did. I LOVE THEM. I make tons of bread in my Kitchenaid and any number of other things. And my Vitamix– well, it’s incredible. I have made cheesecake, smoothies, tomato sauce (WITH the seeds, because it grinds them up!) and I don’t even know what else, and it’s just incredible. Makes me happy every time. So worth the huge price tags! Their versatility helps make it more bearable to pay, too. I agree, good appliances are cheaper! I used to try to get vy cheaper, buying economically, but found long ago, it is actually much cheaper to buy quality. For instance, with all the home cooking and canning we do, my bargan food processors were breaking down and needing replaced often, I finally invested in a Cousinart almost 20 years ago, and haven’t had a problem with it yet! I broke a part which was easily replaced online, even though my particular model was no longer currenet. It still runs and sounds brand new, so it may last me the rest of my life. If I had stayed with my habbit of buying cheap, I would have spent many times what the good one cost me. Same with my Bosch mixer, which is a great all around mixer and bread mixer/kneader. It couldn’t be any easier to make great bread! It’s over 20 years old too, and in great shape despite being used constantly. I tend to buy quality the first time because, as you said, it does save money in the long run. I just love keeping up with your blog. I have been trying to make yogurt from the fresh raw milk that I am buying from a local farmer. I say trying because it never sets up. I’ve heated it to about 110 degrees, add stonyfield farms plain yogurt as my starter and put it in my yogurt maker, it has sat for up to 24 hours and is just runny, just barely thicker than the milk itself. I’ve tried mason jars sitting on a heating pad covered by a pot over night with the same result. It has to sit so long and then it is super tart and still only drinkable not thick enough to use a spoon. I finally super heated it like they tell you to do when using regular store bought milk and put it in my yogurt maker, and it worked, but I just hated doing that with the raw milk. Any ideas what is going wrong? I had the same result heating it only to 110 degrees. Have given up yogurt making. Maybe I just need to heat the milk to a higher temp., too? and it thickens up enough for us to be happy with. I’m not sure. Mine never gets super thick, but neither is it runny. How frustrating that it isn’t working for you! Oh, I’m so jealous! LOL. So far we are of the cheap appliance variety, but to be fair I haven’t done a lot of stuff in the kitchen and we are poor as church mice. But, after reading of your traumatic experience with the cheap processor (not to mention finding all kinds of inspiration on your blog) i’m going to convince hubby that it is time to start saving for some new appliances that will last many years and help me produce lots of yummy goodies. By the way, I read him this blog and he laughed out loud too. I hemmed and hawed for a LONG time before I bought my KitchenAid food processor, but I’ve had it for over 5 years now and use it constantly. I dropped the bowl and broke it last summer and had to order a replacement part immediately. Have fun with your new toy! I got my Kitchen Aid food processor on Valentines day.. LOVE IT I use it weekly. Best investment/gift my husband has ever given me! I’m all about quality. Our friends remodeled their kitchen–major $$$–but bought a super cheap, piece of junk faucet. Seriously? You are going to touch that faucet 25 times a day for the next 10 years–get something nice. When we built our house, we spent extra on solid metal doorknobs and solid core doors. It wasn’t even that much extra but it makes a world of difference. The trade-off was not replacing our not-so-comfy couch for several years. I too am very hard on appliances. They burn up/blow up on me. My reasons are the same as yours except add one to the list; I tend to blow light bulbs, wear out batteries (specifically watch batteries), and always get shocked when I plug things in. My husband jokes about this and says I have chemistry. I am currently without a food processor. I tried to make Homemade Larabars (yummo in a big way) and blew up my old one. It just started running slow and then smoked. I tried to use the blender and it didn’t work out so well. My blender is a kitchen aid and the most expensive small appliance I have ever purchased. It has made it through a lot. I am convinced that some things are worth paying for and small appliances are one of these things. We are currently tryign to be Debt Free and are almost there. My reward when it happens, to by a kitchen aid mixer and food processor. Oh the wonderful sweetness of debt freedom. I can’t wait. I love how you write with such voice…sarcastically funny. It’s just too fun to read. Combine that wittiness with the fact that everything your write about I’m super interested in and you make for one of my very favorite blogs to check everyday. Thanks for all you share! Laura, I have the same kitchenaid food processor and love it! I’ve had it for over 4 years. (my old one – not a kitchenaid- served us well but the motor burned up). I also have the kitchenaid mixer. (I have several attachments and love them). They have both served us very well and they are used a lot! Love your story. You won’t regret spending a little extra money on such a wonderful appliance. Thanks for the good laugh! You are so good at telling your stories. Being overseas, one tends to buy just what one can find or afford, not necessarily good quality. But I was raised to buy the best quality, and sometimes that’s hard to get in another country. She sure IS pretty. Enjoy! What a timely post. I was just thinking a few days ago how I need to start looking for a larger and more efficient food processor to add to my Christmas wish list because the one I have was one given to me and is just too small for our large family. I’ve got a similar Cuisinart food processor and absolutely adore it. I almost always save up for the good appliances. I have every K.A. appliance that is available I think except…….the food processor and I absolutely love the attachments during canning season. I learnt my lesson just like you did. Most of my cheap appliances were wedding gifts and now I’ve had to replace them all. We are especially blessed to have the factory in the next town and also really enjoy Kitchen Aid Experience there as well. I’m just waiting for my food processor to crash but since I have the KA mini chopper I find myself using that many times instead of the food processor. Thanks so much for all the fun posts and very helpful information. Excited for you. One less mess to clean up is worth the investment! She’s lovely, Laura. Simply lovely. Yup, my current processor is part of a long line of cheap, frequently dying processors. I am really hoping that when this one joins it’s unfortunate predecessors we can replace it with a good one too! I bought a Cuisinart 14- cup food processor about 3 years ago and I adore her!! She is a power horse and so worth the money. I used to purchase el-cheapo appliances, too, but now I save for high quality, good warranty appliances. My hubby has been very sweet about surprising me at Christmas or anniversary with something off my “wish” list. I just got a Vita-Mix and and an Excalibur dehydrator. There is such an amazing difference in quality. I’ve been screaching for a food processor for about 6 months. My mini black and decker from our wedding, 18 years ago was dropped and the bowl is unrepairable. The motor runs great, but the bowl was waaaayy to small for humus making. So I haven’t found exactly what I want. I’m looking at the Ninja Kitchen Machine. It would also replace my blender. I like when an appliance can double up! It comes with 2 size cups 40oz and 72oz (apx). The price is what is stopping me. Anyone have one or know someone who does? Also, I don’t think I’ve ever bought anything called a Ninja…sounds a bit corny doesn’t. I just got a Ninja for Christmas. Mine is smaller than what you are talking about-16 and 48 oz. I haven’t been too impressed with it so far because of the size and because it doesn’t quite do everything it promised but since it’s my only food processor, I’ll keep it. I am a huge Kitchen Aid fan not only because of their quality but because of their customer service. I bought a refurbished mixer many years ago and used it alot. It died about 3 years after the warranty expired but when I called the company, they sent me another refurbished one at no cost. They’re also very good about helping you find parts. If you call customer service, they can tell you about special sales that are only available by calling them. That’s how I got my blender for under $30! I have a Kitchenaid, too, and it’s lovely! Mine is white, though ;). I like making hummus. Or grating large amounts of cheese. I dont have a food processor but I have been thinking about buying one. That looks lovely! My hubs bought me a kitchen aid stand mixer for this past Christmas and it’s red and I.LOVE.IT! it’s beautiful and I have found it so useful. Congrats on the new toy! It was my Kitchen Aid mixer that chased me down the counter. It just could not hold up to the whole wheat. Now I have a Bosch that is my mixer, food processor, meat grinder, and blender all in one. It has lasted 10 years now and is still going strong. I got it on sale for the same price as the kitchen aid because it was a closeout special color and waited till the extra parts were on sale and the old ones died. Yay for a great beginning to your new relationship. I’ve had the14 cup cuisinart for years and years and it’s going strong. Quality equipment is worth it. I used to keep it out on my counter. But I only get it out occasionally, now. My Bosch Universal and my Vitamix take center stage these days. But my Cuisinart does things those machines don’t, so I keep it around for shredding big batches of cheese, etc. Congratulations! 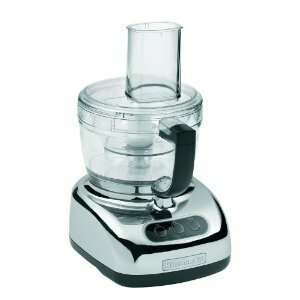 I have a good quality food processor – just bought it this year. Painful, but worth it in the end. My list is a little too long. :) I really will do this eventually and soon(ish) I hope! In the Iliad, Hector is called “breaker of horses”. So glad you shared this. My food processor died a couple weeks ago and I’ve been trying to figure out which one to get. I’d seen this Kitchen Aid one but wasn’t sure because of the price. So it was nice to see a review from you. I love my Kitchenaid food processor as well. The bowl is huge, it’s easy to clean, and it is powerful. I bought it after reading the reviews on Cooks Illustrated. So thankful. We had the same problem with a cheap food processor. It barely made it through 1 canning season, and I did not can near as much as planning to this year! We went all out and got the Cuisinart Prep 9™ 9-Cup Food Processor. Absolutely LOVE it! And got a great deal! I received a 15% off coupon for bridal registry from Bed Bath & Beyond plus the only one they had was the floor model so they gave me an additional 15% off on top of that! Love you blog and inspiration!!!! I’m a quality kind of girl these past years. I have a Cuisinart food processor – HEAVY duty, 11 or 14 cups (I forget), got a good deal at Costco several years ago, and it still DOES the job(s). :) Love it. I had a kitchenAid mixer, but gave it to my mom when I got an Electrolux 23-cup, 600 watt (!) mixer. Maybe someday I’ll get the grinder attachment for meats. :) I have Nutrimill grainmill, and a very old vitamix commercial blender (coffee shop investment gone bad). Truly, having decent appliances makes time in the kitchen SO much more efficient. Now, if I could jus tkeep my counters de-cluttered…! So far, my hand-me-down Braun food processor serves us well. Broke down and purchased a Vitamix that I use for just about everything. My friend has had one for 10+ years and it is still going strong. I use it at least once a day for smoothies, plus I made sunbutter, soups, etc. Best appliance I have ever purchased. I use a cuisinart…love it! Also have a classic kitchenaid mixer, which we acquired on the cheap by buying the floor model when Linens n things went belly-up. I’ve never had a food processor and honestly I’m not sure what the difference is between a food processor and a blender? And do some of the super power blenders like Vitamix do both? I’m confused!??? I think the Vita Mix would do both. I have a cheapo blender which doesn’t do anything fancy – it just makes smoothies and milkshakes. My food processor does many other things, but I guess I wouldn’t want it for milkshakes and such, so I feel the need for both. I’m wondering if I should have skipped this and gone for a VitaMix since it does practically everything! Laura, you might as well been telling my kitchen story! However, I am still using my broken, cheap, food processor, holding out for Mother’s Day. I have a plastic piece jammed in the safety slot (because mine is broke) the lid doesn’t stay on, so I must hold it down, and the cup itself has a crack that runs down the entire thing. I have to blend liquid things fast or I lose a lot on the counter. My “food in the face” reality was processing hot cream of asparagus soup. I plugged in the processor and since the safety is now stuck on, I didn’t realize the switch was on. The walls, ceiling, floor, counter, and my face was green. There was however, NO one in my house that was green with envy. We use our processor almost daily between smoothies, frosting, soup, nuts, etc. Maybe it’s time to upgrade? Laura, laura, laura. You’ve got to start saving for a Bosch!! Mom has had her original for 25 years and it is now in my younger sister’s house making bread and baby food. I’ve had mine for 4 years now, making PB, almond joy larabars, whole wheat bread once a week and green smoothies almost every morning. The only problem I’ve had is the coupling on the blender stand – – a $10.00 part I’ve replaced twice with no big deal. Seriously!!! One big powerful machine with several appliances. I bet that you might even be able to get some sort of a yours and ours giveaway going. Expensive, yes. But SO SUPER worth every penny. I had purchased a new food processor (another well known brand) what even had a dough arm which of course I assumed was supposed to be used for making dough. Go figure! I had used it only about 3 times for other things. The day I decided to try out the dough feature I had all the ingredients in the processor and was so happy as to how it was looking when all of a sudden it started making this horrible noise and began smoking! Well, to my horror the motor had broken. I called the number on the little book it came with and although it was not recalled, Walmart had put a hold on the item which meant they were pulling it from the shelves. Of course it had been several months and I couldn’t find my receipt and got a store credit for much less than what I paid for it. 12 years ago my mom gave me a cuisinart food processor for christmas. I love it. It was used a whole bunch back then, then gently for a few years and it is in full swing again. She always had a cuisinart while I was growing up. I think she only replaced it once, because her pusher piece broke. As for me, when my pusher piece broke after having it for 10 years, i just ordered another pusher piece! ($25 instead of $125 or so). I do have a Kitchen Aid Blender which makes wonderful smoothies, as well as a KA stand mixer. Both were wedding presents 13 years ago. I recently got a KA hand mixer and love it too! I actually thought long and hard about getting a kitchenaid, but in the end I went with Hamilton Beach. There are the only ones that don’t use BPA in their plastic (that I could find atleast). I too go through kitchen applainces like water! Except mine was always the Stand Mixer! My darling hubby bought me a heavy duty model…best that he could afford at the time….several years ago. Over the last 9 months or so I have gone to ALL homemade foods, and making bread for us and my little business was wearing my poor mixer out! So when the tax return came in this year I got to pick out a Kitchen Aid Stand Mixer and was able to get several of the attachments that go with it as well! I am so in love with my Mixer and gushed just as much over it! Nobody but me is allowed to touch it…well I do think I let my hubby help me grind some deer meat one day! I understand completely and will gush right along side of you the next time he replaces one of my appliances with something new! I want to honor my husband who views my kitchen tools just like his own. He would never buy the cheapo ones, because he knows he’ll just have to replace them right away, or they won’t perform the job when he really needs them to. I have an Electrolux (for 10 years) that I just love! I did farmer’s market for four summers, on top of baking our own bread, and it still works like a dream. I also have a Wonder Mill, a 14 cup Cuisinart that he bought me after my Kitchen Aid (wedding gift)food processor finally died after 25 years. We also have a K-Tec blender (which is similar to a Vita Mix). One other wonderful, though inexpensive, kitchen tool that I love every canning season is a Victorio strainer. If you don’t have one, check it out! Tomatoes and apples are SO much easier to process. Laura, congratulations on your new food processor!!! My husband gave me a cuisinart food processor this week! I have been in heaven. It cuts down on prep time so much. Plus, it makes it much easier to cut foods for dehydrating – fast and all the same size. How frustrating! Bosch has many parts that contain BPA as well! I have the exact same one!! Her name is Rosie. Maybe our processors are sisters! I love my KA processor (I don’t use it for hot things) for making hummus and falafels. I also have 2 KA mixers (I used to run a pastry business) that I adore. I have had problems with every appliance I have ever owned except for my KA’s. So happy that you are loving it! Love your blog! I have a Cuisinart I bought in the fall of 1987, while pregnant with my second child. I’ve used it maybe 4-5 times a week for 23 1/2 years. It’s like a member of the family! I’m looking to buy a good FP too, do you still have this one? Any probs? Laura still has hers and is still loving it! So excited! I just bought one of these and wanted to share where. I bought mine from the KitchenAid factory outlet online. There’s a promo code too for an additional 10% off. Any other recipes or ways you’ve used yours would be great! I have a KA food processor too. I’m not sure how u ever lived without it before. I use it pretty much daily. With the different blades I can do all kinds of crazy things. Make french fries, shred cheese or carrots or parmesana or zucchini or…..